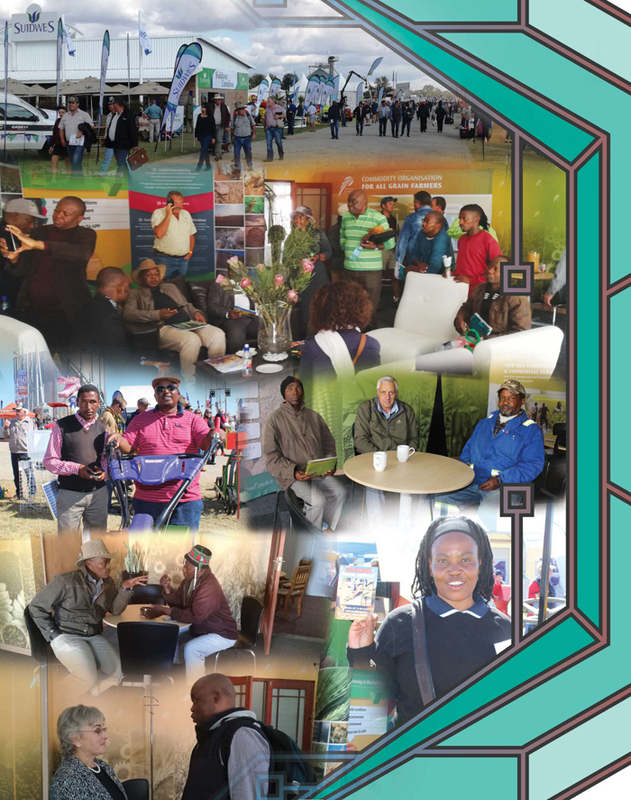 G rain SA’s spectacular NAMPO agricultural show is a week jam packed with so many diverse experiences it is really difficult to capture it in a few words! Suffice it to say that if you are at all interested in agriculture and the agricultural value chain, you really really do need to get to experience at least one day (preferably two!) on the NAMPO farm outside Bothaville for yourself! The extensive exhibition caters for farming enterprises of all sizes – and even though it is Grain SA’s initiative, it is by no means limited to the grain sector – there is something worthwhile for everyone to see and to learn. All the significant role-players in the Agri-sector are represented and the atmosphere is one of excited enthusiasm, a time to celebrate the achievements and progress which keeps our industry dynamic and relevant. There are amazing displays of farm vehicles and equipment, innovative ideas and demonstrations of the latest ‘gizmos and gadgets’ from the smallest drone to the newest seed technologies. There is a wonderful tractor museum which takes many a farmer on a flashback in time and there is a very interesting stall with ‘boerepatente’ displaying the clever ingenuity of farmers’ own designs and engineering plans. While this is certainly an eye-opening experience for farmers, it is also a family outing since there are many stalls which cater for ladies, including a ladies programme filled with interesting talks and demonstrations and the children are spoiled for choice with enticing displays of tractors which they may clamber on with Daddy and close-up encounters with horses, cattle and sheep. The stud breeders bring their pride and joy animals to NAMPO to educate us about their breeds and show off their beautiful animals. Apart from everything there is to see, it is also an opportune time to meet and network with other like-minded people who are also invested in the sector. These are moments where one can learn from other farmers or mentors and pick the brains of top experts in their field about issues ranging from inputs and production to processing, storage and marketing challenges. The fantastic initiative ‘Nation in Conversation’ has become a significant platform where sector leaders, economists, politicians, farmers and other role-players thrash out contemporary and even contentious issues. 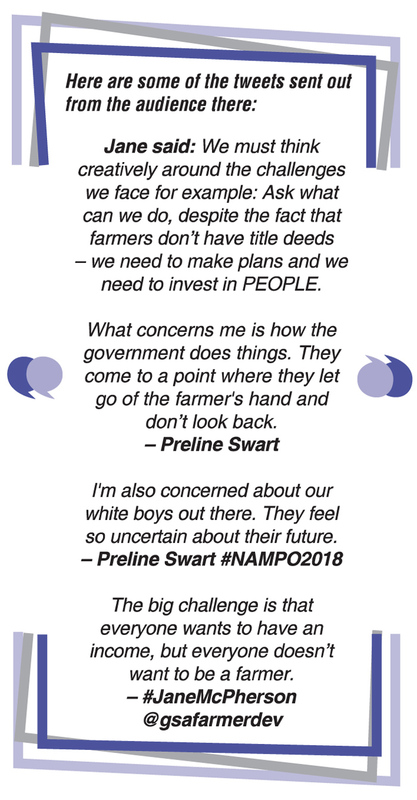 Panel discussions take place throughout NAMPO week in the on-site TV studio and leaders of Grain SA like CEO, Jannie de Villiers, are regular panel members. I was privileged to attend the panel discussion facilitated by Rozanne McKenzie where leaders in our Grain SA Farmer Development Programme, Manager Jane McPherson, and Grain SA Vice-chairperson Preline Swart, talked about the role of women in agriculture. Jane said: ‘We don’t want to feel that men are tolerating us in the sector, we want to be there to make an intellectual contribution’. She also pointed out that we need a holistic solution – access to finance, equipment and inputs – to encourage more female involvement in the sector. Of course, they both had lots to say about the importance of farmer development and transformation in the sector. There is always a loud buzz of conversation in the popular Grain SA Members hall, which is where all farmer members are welcome to go for a cup of coffee or cooldrink and a chat with the Grain SA team managers and mentors. It is always nice to meet our members face to face. Encounters with passionate farmers are inspirational and energise us to keep on with the task of transformation and development. In the words of our Program Manager Jane McPherson: ‘If we could change the paradigm in our minds to reach out to everybody, men and women, big and small we can build an amazing country, we are not going to leave it to the politicians, this is our country and it’s in our hands to make a difference’. 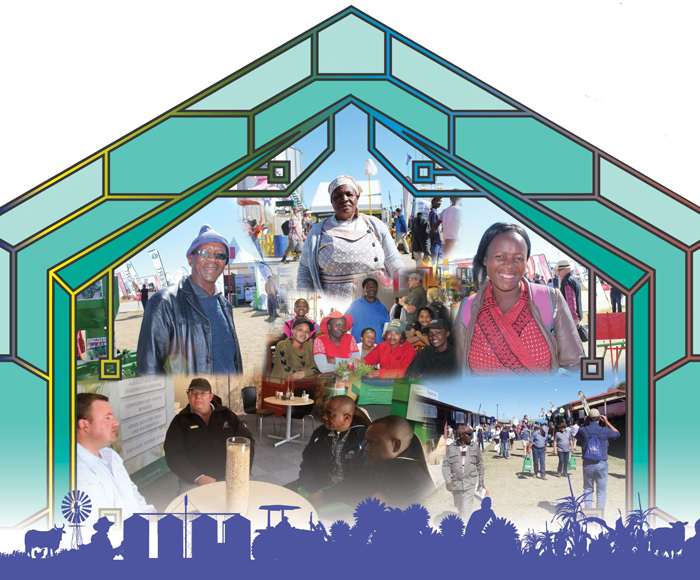 A NAMPO encounter inspires us afresh to keep striving for household food security and the zero-hunger goal and to keep reaching out to take the hands of the wonderful grain farmers of South Africa. Hopefully we’ll meet YOU next year!